Hey guys, I've got a little something different for you today. Migeru, who has been my awesome cleaner/typesetter for so many projects, approached me about a single-volume series she'd translated herself, that she wanted help proofreading since her level of Japanese is low. So while I was not the translator for this project, I did do a very thorough revision so I can guarantee that the quality of translation is the same level you have come to expect from my other projects. The other thing different about this is that it's BL (and quite graphic at that). It's not a story I necessarily would have chosen to translate on my own, but if you are a fan of BL, please give it a try! Finally, rather than serializing, we decided to publish it all in one go, so this is the entire volume in a single release (four chapters plus a couple bonus chapters). Summary: In junior high, Aikou had a crush on his tutor that ended badly. Now in high school, he's joined a "kiss club" at a local bar to try and relearn about love starting with the basics. 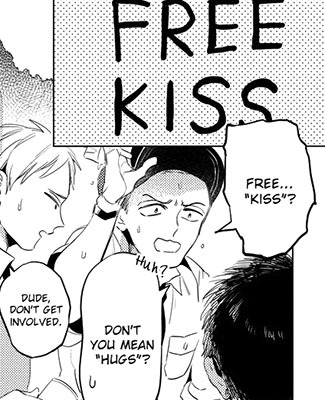 While holding up a "free kisses" sign in the park one day, he's spotted by Eisuke, a boy from his school. Intrigued by Aikou's sign, Eisuke impulsively kisses him. Could this kiss be Aikou's chance to start over?